An exhibition of solid wood architecture models by Italian architect Michele De Lucchi will open at the showroom of designer Ingo Maurer in Munich next month. Called Michele De Lucchi: Architekturchen, the exhibition will showcase the small models of buildings, which De Lucchi carves from blocks of wood with a chainsaw. 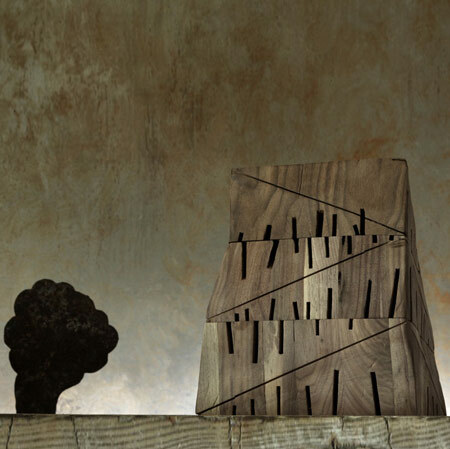 More about Michele De Lucchi's wooden models on Dezeen here. From February 4, 2010, the Italian architect and designer Michele De Lucchi will show a selection of his small wooden architecture models at Ingo Maurer’s space in Munich, Kaiserstrasse 47. Opening and artist talk by Mr. De Lucchi on February 4, 2010, starting at 6 pm. The small wooden houses are studies, born from the desire to experiment and research independent from the clients’ needs. Most of the sculptural works are made of solid wooden blocks, which Mr. De Lucchi models with a chainsaw. The architect said he realised the wish to work manually with wood while sharpening pencils with a penknife. “I moved from the lightness and quietness of the pencil to the roughness and din of the chainsaw, but without sacrificing my effort to treat the wood tenderly, as if it were paper, with effects that may be random but never mechanical“, says De Lucchi in a text about the models. „These are not necessarily houses to be built; they were not made to add houses to houses. I am still wondering why I do these wood houses and why they look so nice so small and twisted, whereas they would be so ugly built on a real scale, all straight and perfect, with their gutters and sealed windows, their shutters and balconies and switches to turn on the lights.“, he continues. Michele De Lucchi has been active as architect and designer since 1973, working for many of the most renowned companies. He also teaches design and has curated several exhibitions.